ST BARTHOLOMEW’S CHURCH has stood at the heart of the Orford community since the stones of the now ruined chancel were first laid in the 12th century. Its role as a place for weekly worship, baptisms, weddings and funerals, as well as concerts, drama and dance performances, lectures, church bazaars and country markets has created an invaluable hub of human interconnection for villagers and visitors alike. Now, with the support of the Diocese of St Edmundsbury and the Church Buildings Council – the Church of England’s conservation body – Orford Church plans to embark on a further journey of renewal, to be enjoyed by all. In a matter of months, the perfect acoustics of Orford Church could echo to the brilliant sounds of a new pipe organ. The instrument, formerly the organ of the Turner Sims Concert Hall in Southampton, is a generous gift from the University. To build such an organ from scratch would cost nearly £600,000 – a sum we could not possibly afford. But we can make our vision for the future a reality with a fundraising target of £120,000 to complete the restoration and installation. For this, we are reaching out to the whole community, and those beyond, who have a connection to the church, the village or a passion for music in churches. Why does the church need a new organ? Back in the 18th century, the church had a West Gallery with an organ mounted on it. All traces of the gallery and organ were swept away when the tower collapsed in the 19th century. The present organ was brought in over 100 years ago as a temporary measure, and has never been replaced: in services, its scope is musically very limited, and it cannot be used for concerts. What’s special about this organ? The new organ was built in 1977 by Peter Collins – one of the UK’s finest organ builders (his most famous organ is in St Peter Mancroft in Norwich). It can perform, magnificently, music from the Baroque period to the present day. The Orford organ will be unique in the County. It will not only support the congregation and Orford’s excellent choir in services but will allow us to expand the musical range of concerts and recitals in the church – those we mount ourselves, and those we host with other promoters, making the church an even more significant music venue than it already is. Orford Church has a distinguished record as a concert venue – we have hosted the world premieres of Benjamin Britten’s Three Church Parables and Noyes Fludde; it is also a sought-after recording venue, and many of the world’s finest singers, instrumentalists and choirs have performed here. With our new organ, we can ensure that the future of music-making in Orford is secured, and that new learning opportunities for young people and adults will be opened up for our own and future generations. The organ was originally removed from Southampton to protect it from the threat of flooding, and it spent several years in storage. From the 17th century until the advent of the telephone exchange, pipe organs were the most complex of man-made machines. They are no less intricate today, but even beautifully crafted and well-maintained organs suffer from the ravages of time: wood can warp, leather perishes, metal pipes collapse and electrical wiring deteriorates; thousands of small and intricate hand-made parts have to be checked, repaired or renewed. The Collins organ now requires a full programme of restoration which will bring it triumphantly back to life. 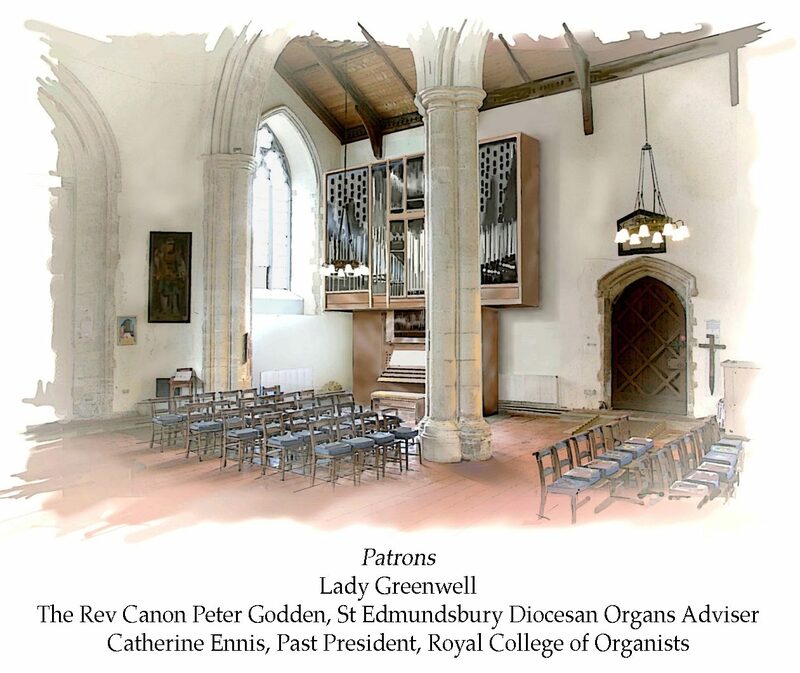 After a few months on display in Orford, the organ is now with Cousans Organs near Leicester – some of their expert craftsmen have worked on the instrument since it was new. We aim to bring it back to be dedicated, appropriately, on Easter Sunday, 21st April 2019. This will be followed by an inaugural festival in May which will deliver the first series of prestigious musical events only conceivable with this gift to our church. Follow this link to read the fascinating history of the organ project, see more photos and the latest news on the project. Follow this link for a detailed photo gallery of the restoration. Follow this link to donate to the Orford Organ Project via Justgiving.